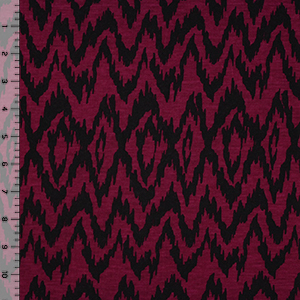 Black ikat diamond shape repeating design on a burgundy wine color background soft cotton jersey rayon blend knit. Fabric has a soft hand, good stretch, nice drape, and is light weight. Diamond ikat measures 4 1/2" (see image for scale). In Stock: Only 1 yard left!